Allow subclasses to be instantiated. Return the currently set upper bound on what get_weight() can return. Skip the iterator forward if in the decreasing range, and weight is low. Flag, set to true if there are docs after the end of the range. Read weights from a value which is known to decrease as docid increases. This posting source can be used, like ValueWeightPostingSource, to add a weight contribution to a query based on the values stored in a slot. The values in the slot must be serialised as by sortable_serialise(). However, this posting source is additionally given a range of document IDs, within which the weight is known to be decreasing. ie, for all documents with ids A and B within this range (including the endpoints), where A is less than B, the weight of A is less than or equal to the weight of B. This can allow the posting source to skip to the end of the range quickly if insufficient weight is left in the posting source for a particular source. By default, the range is assumed to cover all document IDs. The ordering property can be arranged at index time, or by sorting an indexed database to produce a new, sorted, database. slot_ The value slot to read values from. Check if the specified docid occurs. return true, having moved to a definite position (including "at_end"), which must be the same position as skip_to() would have moved to. return false, having moved to an "indeterminate" position, such that a subsequent call to next() or skip_to() will move to the next matching position after did. Generally, this method should act like skip_to() and return true if that can be done at little extra cost. Otherwise it should simply check if a particular docid is present, returning true if it is, and false if it isn't. The default implementation calls skip_to() and always returns true. 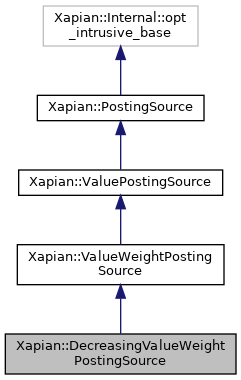 Xapian will always call init() on a PostingSource before calling this for the first time. Note: in the case of a multi-database search, the docid specified is the docid in the single subdatabase relevant to this posting source. See the init() method for details. did The document id to check. min_wt The minimum weight contribution that is needed (this is just a hint which subclasses may ignore). The clone should inherit the configuration of the parent, but need not inherit the state. ie, the clone does not need to be in the same iteration position as the original: the matcher will always call init() on the clone before attempting to move the iterator, or read the information about the current position of the iterator. This may return NULL to indicate that cloning is not supported. In this case, the PostingSource may only be used with a single-database search. This default implementation returns a generic answer. This default it provided to avoid forcing those deriving their own PostingSource subclass from having to implement this (they may not care what get_description() gives for their subclass). Return the weight contribution for the current document. This default implementation always returns 0, for convenience when implementing "weight-less" PostingSource subclasses. This method may assume that it will only be called when there is a "current document". In detail: Xapian will always call init() on a PostingSource before calling this for the first time. It will also only call this if the PostingSource reports that it is pointing to a valid document (ie, it will not call it before calling at least one of next(), skip_to() or check(), and will ensure that the PostingSource is not at the end by calling at_end()). Set this PostingSource to the start of the list of postings. This is called automatically by the matcher prior to each query being processed. If a PostingSource is used for multiple searches, init() will therefore be called multiple times, and must handle this by using the database passed in the most recent call. db The database which the PostingSource should iterate through. Note: in the case of a multi-database search, a separate PostingSource will be used for each database (the separate PostingSources will be obtained using clone()), and each PostingSource will be passed one of the sub-databases as the db parameter here. The db parameter will therefore always refer to a single database. All docids passed to, or returned from, the PostingSource refer to docids in that single database, rather than in the multi-database. Name of the posting source class. This is used when serialising and unserialising posting sources; for example, for performing remote searches. If the subclass is in a C++ namespace, the namespace should be included in the name, using "::" as a separator. For example, for a PostingSource subclass called "FooPostingSource" in the "Xapian" namespace the result of this call should be "Xapian::FooPostingSource". This should only be implemented if serialise() and unserialise() are also implemented. The default implementation returns an empty string. If this returns an empty string, Xapian will assume that serialise() and unserialise() are not implemented. Advance the current position to the next matching document. The PostingSource starts before the first entry in the list, so next(), skip_to() or check() must be called before any methods which need the context of the current position. Serialise object parameters into a string. The serialised parameters should represent the configuration of the posting source, but need not (indeed, should not) represent the current iteration state. Advance to the specified docid. If the specified docid isn't in the list, position ourselves on the first document after it (or at_end() if no greater docids are present). If the current position is already the specified docid, this method will leave the position unmodified. If the specified docid is earlier than the current position, the behaviour is unspecified. A sensible behaviour would be to leave the current position unmodified, but it is also reasonable to move to the specified docid. The default implementation calls next() repeatedly, which works but skip_to() can often be implemented much more efficiently. did The document id to advance to. Create object given string serialisation returned by serialise(). serialised A serialised instance of this PostingSource subclass. End of range of docids for which weights are known to be decreasing. Start of range of docids for which weights are known to be decreasing.